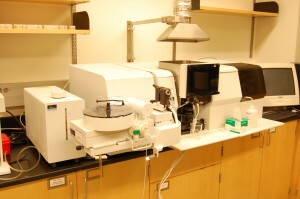 About 70 different chemical elements can be quantitatively determined using the Atomic Absorption Spectrometer (AAS). The AAS very accurately measures the absorption of a specific wavelength of light by atoms that have been converted to the gaseous state with either a 2300º C acetylene flame, or utilizing a temperature step program and a graphite tube. Most recently the AAS has been used to measure the amount of common metals in water, lead in river sediments and local house paint, and iron in alpine soils.